An outdoor compressor is an electric pump, or heart of the system, that circulates the refrigerant in a closed loop between the condenser and evaporator coils. Compressors come in more than one variety. According to Consumer Reports™ a reciprocating compressor is more trouble-prone than a scroll type one. While pricier, scroll-type compressors do tend to be higher in efficiency and quieter than reciprocating compressors. Most manufacturers offer both types of compressor. The majority of homes and smaller commercial air conditioning systems circulate a compressed gas refrigerant, widely recognized as Freon, in a closed “split” system to cool and condition inside air. 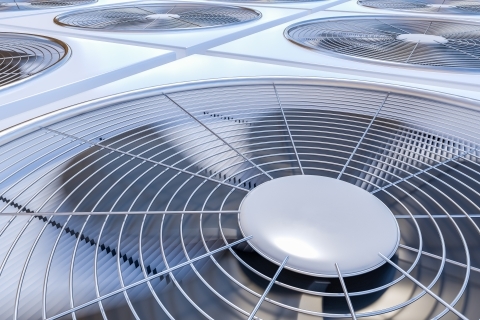 The refrigerant helps to cool and dehumidify the inside air and has to be re-cooled and condensed, and outside air is the medium most often used to accomplish this. The term “split” simply means that components are divided into inside and outside portions as opposed to being located together in a “package” unit. In a “forced air” system, an internal blower circulates the conditioned air through ducts to the rooms where the cooler air is needed. The air ducts generally run either below the ceiling and inside the rooms (conditioned air) or in the attic (unconditioned air). An outside fan pulls air across the external parts of the system to cool and condense the refrigerant. As pressure on a gas decreases, the gas expands and cools. Increasing pressure makes the temperature rise. These phase changes are also expressed as evaporation and condensation, which is how evaporator coils and condenser coils get their names. 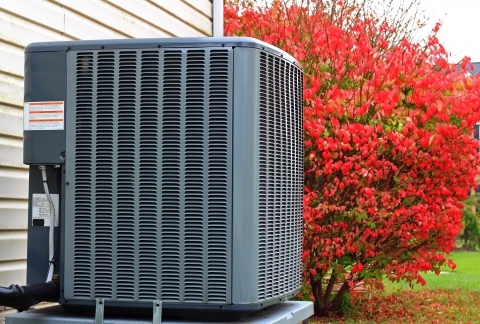 Refrigerants, including Freon and Puron may never need recharging through the life of your AC. The blower moves the warm indoor air over the chilled evaporator apparatus as the exterior exhaust fan moves hot air away from the heated condenser coils. All air conditioning units, including window units, heat pumps and ductless units operate on the same principle. They differ only in the size and configuration of the coils. An air handling unit is indoors where the blower and related portion of the central air conditioning system moves air through the air ducts. The air filters are indoor elements that trap dust, pollen, and other airborne particles as air moves through the air conditioning system. Air filters contribute to both reliable air conditioner operation and health. As the coolant inside the metal coils evaporates, it acts as a heat sink for the air that moves across it from the blower. Copper conducts heat readily, so the coils that contain the coolant are usually made of metal. To maximize surface area and provide more cooling power, the copper coils have metal fins or vanes surrounding them. In dual or hybrid heat systems, the same coils that act as evaporation sites in the summer to cool your home become condensation sites in the winter to provide warmth. During routine seasonal maintenance, your AC Service cleans the interior coils for you, but if you notice reduced cooling capacity, check the coils for signs of dirt or ice. These are outdoors and consist of a network of tubes filled with refrigerant that remove heat from the heated gas refrigerant and convert the refrigerant into a liquid form again. The excess heat escapes into the outside air. 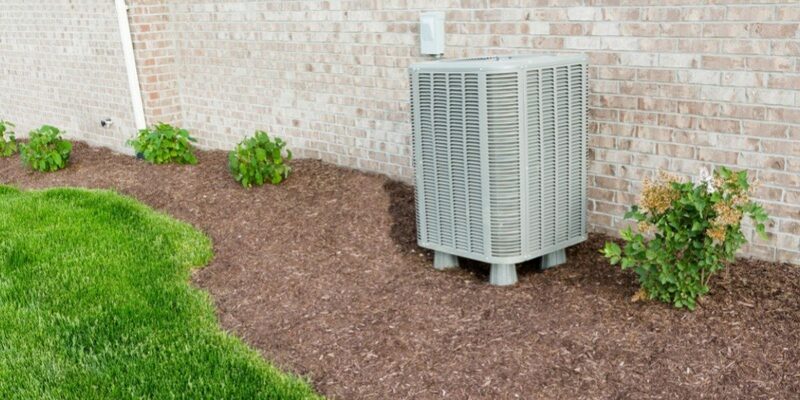 Your air conditioner’s condenser apparatus is outside where waste heat can dissipate to the outdoor air as the heated gas inside it returns to its liquid state under pressure. Like the interior coils, the exterior coils are a heat transfer site, however, the heat moves in the opposite direction, going from the coolant into the surrounding air with the help of exhaust fans. Outside units are susceptible to collecting dust, pollen and other debris, but they are easier to clean than interior coils. Your air conditioner runs more efficiently when excess heat leaves the system quickly, so keeping the coils clean can lower utility bills and lengthen the lifespan of your system. To remove any build-up of dirt, a stiff nylon brush, can of commercial cleaning solution and a hose are usually sufficient. Always turn off power to the unit before cleaning the vanes, coils and grill on an interior unit. It’s best to call a professional AC Service to clean the coils thoroughly if the unit has not been cleaned in some time. An outside fan pulls the air through the condenser coils for heat dispersal. For the first time cleaning interior and exterior coils, calling an HVAC specialist is a good idea. At Ace Hi Plumbing, Heating & Air we have NATE-Trained technicians who can give you tips on keeping coils clean, free of debris and help you to devise a maintenance schedule to help your AC run at peak efficiency. Heat pump Air conditioning is a combination of air conditioning and a heating system. In one mode, it functions as an air conditioner. In the reverse mode, it becomes a heater. During the normal condensation process, an AC produces a significant amount of water as a by-product. In a central AC system, there is a primary system of pipes, often made of PVC, that carry this condensate water to the outside of the building. This piping needs periodic piping to prevent from getting stopped up with the algae and similar growth. At a minimum this type of maintenance should be done by your AC Service company during an annual system tune-up An inside AC system should have an emergency drain in case the primary drain lines stop up. This pan usually comes with an automatic cut-off switch that turns your AC system off when the pan fills up with water. Water will run out of the pan and into the ceiling or anything located below the pan. The need to flush the drain lines is a prime example of how a little preventative maintenance can prevent a major repair.